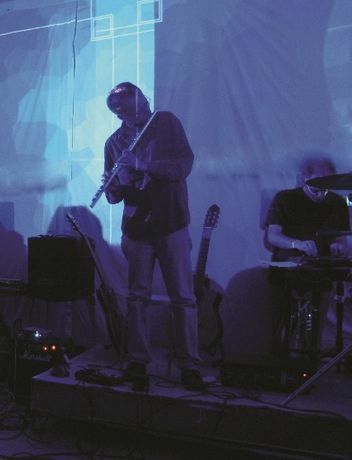 A spontaneous free improvisation in an old post office squatted by the group in the Autumn of 1999 signaled the beginning of their work. The artists went on to occupy several buildings, a neglected village hall, disused commercial properties, starlit hillsides for the night, creating art out of these environments, events mixing composed and improvised elements.? In 2002 a transmitter on the roof of a former shop in Air St. Brighton began sending out their audio via the local radio 4a network. Here the group's practice of improvising without reference to structure has led to the description 'acoustic noise', although the radioshow also includes electronics and samples, artificial intelligence, spoken word and harmonic and melodic elements. In May 2006 the ensemble premiered their noise piece 'my tinnitus' in the Brighton festival. Essentially the work is the installation of a high pitched sine wave of duration, a minimum three days, with visual and dance representations, where the musicians attempt to create music out of what might be disturbance. Baby have worked with theatre and film director Rikki Tarascas on short stories by cult sci-fi author Jeff Noon culminating in live performance/readings with the group composing for and improvising with the texts. Their album releases include the recent 'Near Wanstonia' recorded whilst living by a busy stretch of the A12 in East London.